Bonney Plumbing, Electrical, Heating and Air believes in the importance of community involvement and giving back to the Sacramento region through its philanthropic endeavors. Philanthropic is a fancy way of saying Do Good, Be Kind, and Help People. For over 40 years Bonney has been doing good, being kind, and giving back to the local community we care about. It’s not just talk, we put our words into action. At Bonney, we especially take pride in helping those less fortunate who may need a helping hand. Last week Bonney Plumbing had an opportunity to help a disabled senior citizen in South Sacramento who was having major plumbing issues. His main sewer line was backing up in his toilet, sink, and tub. 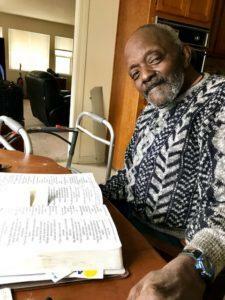 Charles C., who has several serious health issues and uses a walker to get around had a plumber come out who would clear the clog every couple months, but the problem still persisted and was getting steadily worse. Charles needed a permanent solution, not just a Band-aid fix. His toilet, bathtub, and sink were backing up again, and that’s when he called Bonney. 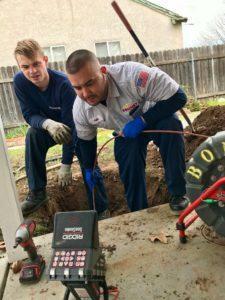 Bonney 5-star certified plumber Eric Sanchez showed up to Charles’ home in South Sacramento to perform 5-star sewer service. He tried to cable the line so Charles could get things flowing again but it was a no-go. “I tried for 30 minutes but something was blocking it.” Eric said. The Bonney Sewer & Drain duo of Nick Camuso and Kyle Simms came out to camera the line with Bonney-vision technology. As suspected, they found sections of the sewer line were collapsed due to tree root intrusion and the age of the pipe. There was no doubt, his sewer line needed to be replaced. Bonney tried to get Charles special no interest financing from various credit companies, but he did not qualify. That’s when Charles’ eyes started tearing up. He was feeling despondent and desperate. Charles has no family in the area to rely on. He just scrapes by on a fixed income every month. His caregiver, Zetta, told us he was really stressed out about the whole situation and it was having an effect on his already frail health. “When you can’t use your own bathroom, then what?” she said. She called around to various agencies to see if Charles could get some financial assistance but nothing was available. Things were getting desperate. That’s when Charles took out his Bible and started to pray. This was not a typical sewer and drain call for our Bonney plumbers. They knew deep down they had to do something to help Charles out. He had nowhere to turn. They collectively thought, ”Lets do it, lets help this man out and do it for free.” Kyle added, “Honestly, it’s an amazing feeling to perform a good deed. We’re blessed at Bonney to be able to help those who need it most in our community.” Charles was definitely in desperate need of help, and Bonney stepped up to the plate for him. Charles said he was praying to the lord when “the nice young man from Bonney knocked on my door, and that’s when he laid the good news on me”. While the Bonney 5-star certified sewer and drain team were working hard to replace the main sewer line for Charles, his caretaker Zetta arrived to take him to another one of his doctor visits. Charles would no longer have to worry about his toilet, bathtub, and sink backing up. He could now focus solely on his health. Zetta said, “These days, it’s nearly impossible to get anything for free. What Bonney did is beyond comprehension”. Charles was extremely thankful. He’s a deeply religious man who had his bible within reach on the kitchen table. Charles said, “If God hadn’t put me in his heart, I don’t know where’d I’d be. I thank God above first, then Bonney”.